Aplus Finetek Sensor, Inc. announces the availability of the FG Series Magnetic Float Level Transmitter for use in measuring the continuously changing level of a variety of liquids within many industries including water/wastewater treatment, chemical processing, petrochemical, fuel and many general industrial and commercial level measurement applications. Using state-of-the-art reed switch technology the FG magnetic float level transmitter will provide a 2-wire 4-20mA or 3-wire resistance output directly reflective of the changing level of a fluid in a tank or other type of vessel. Wetted materials can be a variety of stainless and plastic. The FG magnetic float level transmitter is offered with a wide range of threaded or flanged process mounting connections to meet the needs of virtually any installation. The FG magnetic float level transmitter is available for use with fluids with a specific gravity of 0.5 and above, meaning the FG level transmitter can be used in a large number of possible applications, including where explosionproof ratings and marine certifications are required. 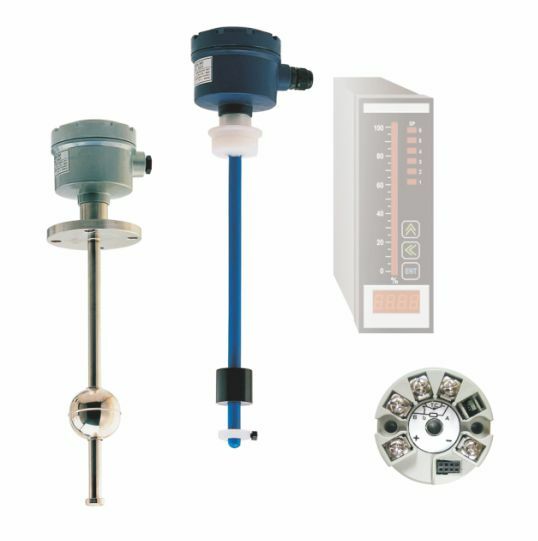 The FG series magnetic float level transmitter is cost-effective, of high quality and reliability, and offers a measurement resolution of 0.25″ (6.35mm) or 0.5″ (12.7mm). Enclosure materials of construction are available in aluminum, plastic and 316SS making this level transmitter applicable in almost any situation. For more information look at our FG Series product page and contact Aplus Finetek Sensor, Inc. at 815-632-3132 or email us at info@aplusfine.com.